The wake-up calls start at 5:30 am. It’s a guitar playing somewhere in the forest, or a drum, I can’t quite tell. Music from the all-night Hindu festival in the neighboring village is still seeping in through the trees. By 6:00 we’re all gathered in a circle, stretching and exchanging good morning hugs. A few minutes later we are split into groups: watering, mulching, solar panel maintenance, zero-waste recycling. And off we go into the forest. I’ve come to volunteer at Sadhana Forest, a reforestation community in southeastern India. Since 2003, a dedicated group of volunteers have been working to rebuild an almost completely decimated forest. 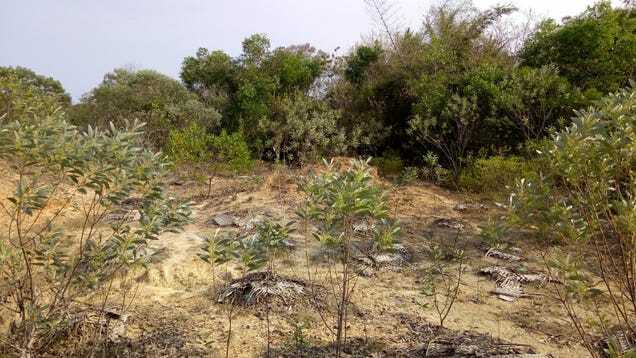 Thanks to a mix of agricultural expansion and colonial pillaging, this Tropical Dry Evergreen Forest, unique in the world, had nearly disappeared. What happened to this particular forest is an example of a worldwide trend. Since 1990, the planet has lost over 1.3 million square kilometers of forests - an area larger than South Africa. And according to a report in Global Forest Watch, worldwide loss of tree cover (the loss of tree canopy due to human or natural causes) reached a record 73.4 million acres in 2016. We hear a lot about saving the rainforests and planting trees, but it’s hard to really imagine what that looks like on the ground. You need to touch the lifeless reality of deforested soil, feel the relentless sun on your head from lack of tree-cover. On my first day, I’m part of the watering team and we fill a wagon full of 10-liter water jugs and push off. Our crew is tasked with watering saplings that have been planted in this more rugged and treeless area. About 10 work hours are needed to build each big mound of soil and mulch and various other ingredients that shelter the newborns through their infancy. I do my watering job, walking through thorny dried-out shrubs. The ground beneath us is a bleached rocky desert, the sun forever baking it into inhospitable hardpan. No trees to give shade, no soil to hold the water. The physical understanding starts to take hold. The negative effects of deforestation are wide-ranging. Forests are home to 80% of the planet’s (non-aquatic) species, so every acre lost puts species at risk of extinction. Take the current case in Australia. About 85% of the country’s plants, 84% of its mammals and 45% of its birds are found down-under and nowhere else. Once we lose them they are gone forever. Yet, as covered in this Guardian piece, Australia is clearing forests at an alarming rate, with millions of acres set to be deforested for industry. Our forests are also intimately connected to climate change. We may know from 9th grade science class that trees capture CO2, but are we aware that deforestation adds more CO2 to the atmosphere than the sum of all the cars and trucks on the world’s roads? This is another point that we’ll nod our heads to in somber acknowledgment, but that doesn’t become an actionable reality until you’ve walked from a treeless hellscape and into the cool shelter of neighboring canopy. Reforestation work should be mandatory for all climate change deniers. They’ll only need an afternoon. And then there’s soil erosion. It may not be the environmentalist’s sexiest issue, but the fact is that half the topsoil on the planet has been lost in the last 150 years. And topsoil, the nutrient-rich and organism-full layer of living dirt, takes hundreds of years to form and is absolutely necessary for plant life to grow (read: necessary to feed ourselves). But without tree roots, dead leaves on the ground, and other natural barriers, our soil gets washed away; rainwaters running unimpeded through the treeless areas, leaving the ground even more barren and open to the ravages of the elements. This process not only flushes away one of our most valuable natural commodities but causes other issues like increased flooding and clogged waterways. During my second day of “seva” (selfless service) I was working in the rebuilt forest, raking up dead leaves and bagging them for mulching use in the more desolate parts of the forest. Kneeling down to bag the leaves, I saw little seedling trees sprouting up all around me, naturally. No tree planting needed. Just a few trees providing shade and water protection and some leaves on ground – and bingo – water pooling in the area instead of rushing through, organisms forming in the now humid soil, creatures eating decomposing leaves, and falling seeds landing in suddenly fertile territory. With the help of over a thousand volunteers every year, Sadhana Forest has already planted over 35,000 trees across 70 acres here in India (100,000 more trees in their projects in Haiti and Kenya). They are a grassroots example of how the individual can make a difference. There are also other large scale projects like the one being led by Conservation International that will plant 73 million trees in the Brazilian Amazon and become the largest tropical reforestation project in history. Or the U.K. company using drones to mass-plant up to one billion trees per year. Big or small, every bit helps. Get informed or even get involved. I’m glad I did.